This blog is documenting the journey of my wife Rebekah and I learning how to farm one day at a time and enjoying every minute. We will both be writing about our experiences as we learn how to run a farm here in Hawaii. We have been reading the books and studying for about 7 years on various aspects of farming and we now have a chance thanks to the Good Lord to put it into practice and it should be interesting. So far we have a year old ram, 10 Chickens, and two puppies with 10 baby piglets on the way and we are jumping in with both feet. When i went to pick up the ram with my father in law Tim it was interesting to say the least. I had no plan of how to get him home except thinking somehow i will put him in the back of my truck and tie him up. When we got there i realized this fella isn't just going to jump in at my command. So i proceeded to try and pick him up which went better than expected considering i figured based on youtube of course he may give me a few good kicks and a head but. Thankfully Holstein is a civilized ram and was nice and easy on this newbie. 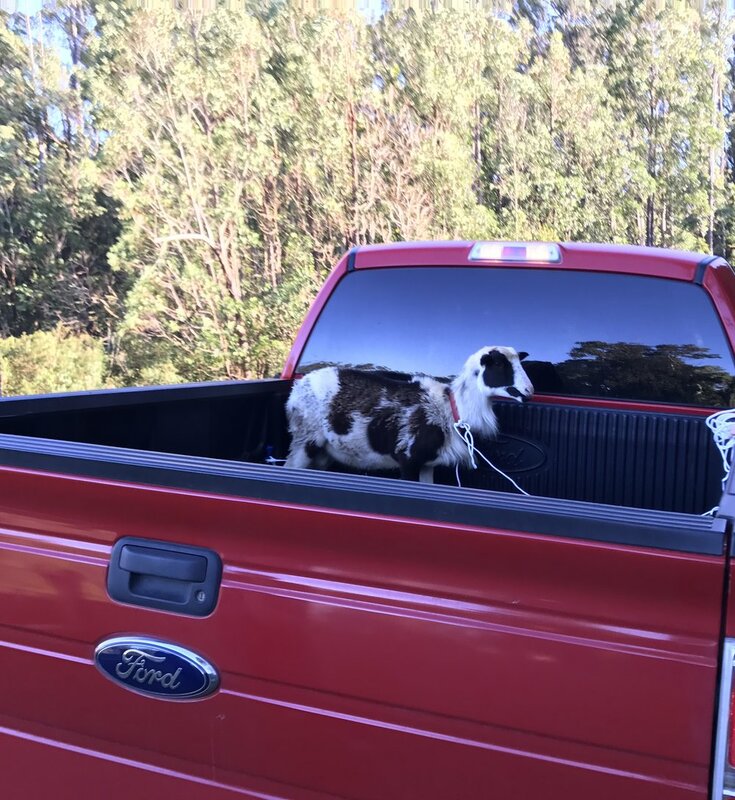 He rode home in the back of the truck like a king and enjoyed his untouched new pasture at the farm. He did leave me a few goodies in the back of the truck but i figured that was fair. Next we took the chicks from the brooder since they were good to be on pasture and put them in with Holstein. So far they are amicable and he occasionally reminds them he is boss of the pasture and moves them over with his head when he wants to get to something they are in the way of. The kids from church have named one of the chickens the only black one Heyhey and he seems to be a favorite. Next in a week or so the 10 pigs come which literally means I "Darrell" have to go find away to pick up 10 piglets an hour away and keep them in the back of the truck the whole way home so i arrive home with 10. Still working on that plan but thats how you learn right! I will post some pictures and the story with it.